Live it! 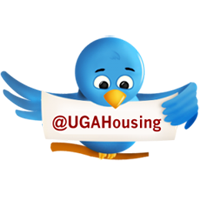 UGA Housing: Best Video Tour: Where are they now? Best Video Tour: Where are they now? Last year, Jessica Jarrett and her roommate, Caroline Bagley, took flight with the Best Video Tour contest -- figuratively at least. For their tour of Creswell Hall, the two transformed into flight attendants and gave the entire University Housing crew a tour of all the things they loved about their hall and their room. In the end they reached their destination, taking home the title of "Best Video Tour" and securing their living spaces for this year. Watch the entire 2012 Best Video Tour playlist on our YouTube channel. for their winning Best Video Tour. After taking home the title, the two decided to select separate living spaces for this year. University Housing caught up with the pair to talk about their participation in last year's contest, the big win, and find out how they're making the most out of their prize picks. UH: How much time and effort went into completing your Room of the Year entry? JJ: We spent quite a bit of time cleaning and preparing for the video; all the Goodwill shopping and all that jazz. It took a while to film and to edit the footage but the whole process was extremely fun. CB: We definitely had to tidy up the room a bit before we started filming. Let’s face it. We’re college students.. our dorm never really looked as nice as it did in our video! After everything was in order, beds made and rugs vacuumed, we were ready to start filming. Our original idea was an MTV Cribs style video that never really turned out, so we ended up refilming everything only a couple of days before the submission deadline. I guess it’s a good thing our first video was such a flop since our finished product actually ended up winning the contest! UH: Would you do it again? JJ: If I hadn’t won, and wasn’t living in the amazing dorm I am now, I’d definitely do it again. It was a lot of fun, and I’m always up for a little friendly competition. CB: I’d love to do it again. It was fun to stretch out some creative muscles I hadn’t used in a while. My roommate Jessica handled all of the video editing and most of the filming (and thank goodness, I would have had no idea what to do!). But, I’d like to try again and see what I could come up with on my own. I also had a really bad cold at the time that we recorded the sound portion of the video, so if anything I’d just like to prove to the UGA student body that no, I don’t always sound like that, and yes, I am capable of pronouncing nasal consonants. UH: Why did you enter last year's contest? JJ: I entered last year’s competition because I really wanted to be on East Campus for this year. The dorms are fantastic and I’m a music major. It was incredibly convenient for me to live over here since I practically lived on East Campus last year anyway. CB: My roommate and I just really, really wanted to be able to pick our housing. Sophomores seem to be at the bottom of the totem pole when it comes to getting housing assignments, so we wanted to make sure we got the dorms we wanted. Don’t get me wrong, Creswell was… well, Creswell was Creswell. I loved it while I was there but I knew I’d like a little more space my sophomore year. UH: If you took advantage of the prize, how did you select a living space for this year? CB: I visited friends in Myers Hall my freshman year and I knew that the rooms were bigger and that the amenities there were really nice. Plus it’s right in-between Snelling and O-house, which is probably my favorite feature about the place. Location, location, location! UH: How did it benefit you to be able to select your space for next year? JJ: The convenience factor was a huge part for me. I live on East Campus, I have all of my classes on East Campus, and I work at the Ramsey Center which is on East Campus. An all-around, win-win-win situation for me. CB: This year I’ve got a single dorm in Myers and it’s absolutely fabulous. Of course sometimes I miss having a roommate, but there are many advantages to having a space to yourself that you can unwind in. UH: Did you decorate your space again this year? Would you mind sharing pics? JJ: I decorated my room very similar to my room last year, except I have an obscene amount of wall space this year that made decorating a little harder. I hung all of my posters from last year, added a few more, hung Christmas lights all around the ceiling in my room, and bought a butterfly chair to hang out in. We decorated the living room with some artwork, this really awesome lamp my roommate, Sarah, brought, and a significantly larger TV than we had last year, curtsey of moi. CB: Jessica was big on decorating last year, and that’s why our dorm looked as nice as it did. I thought she was insane for suggesting we buy softer lights instead of using the overhead fluorescents and I really didn’t understand the need for the amount of command hooks she purchased over the course of the year. Obviously she knew what she was doing though, because this year I’ve decorated with Star Trek posters and piles of dirty laundry… my dorm doesn’t quite have that same ambience that it had last year. CB: Overall entering in the contest was a really fun experience. I heard that they showed our video to the entire freshman class this year, which is pretty neat. Plus, the YouTube video got way more “likes” than all of my cat videos combined. Score! Do you think you have what it takes to win the title of Best Room? Enter to win the Room of the Year contest today! Are you ready for your next great adventure?